This quarter we are putting the spotlight on AirTight FaciliTech’s Customer Service Manager Jimmy Jack aka the “Jack of all Trades”. Jimmy has been with AirTight FaciliTech since 2010 and recently took over the management responsibility for our Customer Service Team in January of 2016. He has worn many hats within the organization prior to 2016, often being put in charge of strategic projects that needed someone with his technical aptitude and project management skillset. Jimmy has the kind of attitude that just gets things done. This is also where Jimmy learned the ins and outs of the data center / mission critical cooling world and the complex infrastructure power systems that support them. Originally from Fayetteville, NC, Jimmy has a competitive spirit that comes from growing up an athlete. He has played football, learned Tae Kwon Do and surprisingly was also a competitive speed skater (on roller skates that is!). Combine roller skating, football with a 3rd degree black belt in Tae Kwon Do as well as ROTC and you’ve got an interesting dynamic of an individual. If you take a look at online videos of the opening ceremonies during 1988 Seoul Olympics, you will find Jimmy Jack participating in the Tae Kwon Do exhibition. Jimmy originally spent many years in the custom Autosound industry putting together high end audio and video systems into many local celebrity whips such as the Carolina Panthers Thomas Davis, Rod Smart and NASCAR’s Jimmy Johnson and Dale Earnhardt Jr. Working with local NASCAR celebrities also gave him the opportunity to drive the chase truck for Robbie Gordon in the Dakar Rally in Africa. Jimmy has been married to Maggie for 3 years. He has two daughters, Meghan and Savannah, and two golden retrievers, Phoebe and Pepper. We are happy to have Jimmy working right inside the heartbeat of the company, customer service. 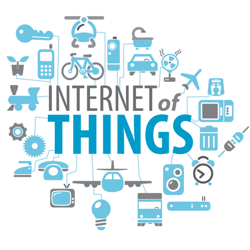 The Internet of Things is a phrase that we are hearing more and more often. This is in it's infancy, so be prepared to hear it many more times. Many have a general grasp of what it is, but why does it matter to you, a regular person living a “normal” life? It matters because this technology is going to make your life simpler, safer and really, if you can embrace it, more fun. Lets be geeky for a moment and really define it: The Internet of Things (IoT) is a system of interrelated computing devices, mechanical and digital machines, objects, animals or people that are provided with identifiers and the ability to transfer data over a network without requiring human-to-human or human-to-computer interaction. Now in layman terms: Everything that we use, from kitchen appliances, to running shoes to a CNC machine in your factory, all talking the same computer language and sharing relevant data. Relevant data is specific to the item, the being or the site, as determined by the programmer. As the programmer of your life, you get to decide what you want to share and keep, data-wise. Think about the TV commercial that says, “Honey, can you pick up milk on the way home?” The guys looks at his smart phone and actually uses it to actually look into the fridge to see if they truly need milk or not. Those running shoes you like - the data shows they are good for 2 years or 200 miles. Guess what happens when your running shoes, with embedded technology, gets near one of those thresholds? You get a text from ABC shoe company showing you their latest and greatest models, and probably a video testimonial or 3 PLUS details where you can buy them locally. So if your shoes can trigger all that, the possibilities are endless. While we have no connection to the companies listed or their ideas and opinions, these seem to be some of the best sources for non-geek understanding of this emerging technology.